Smarter, premium repeater with hybrid functionality. 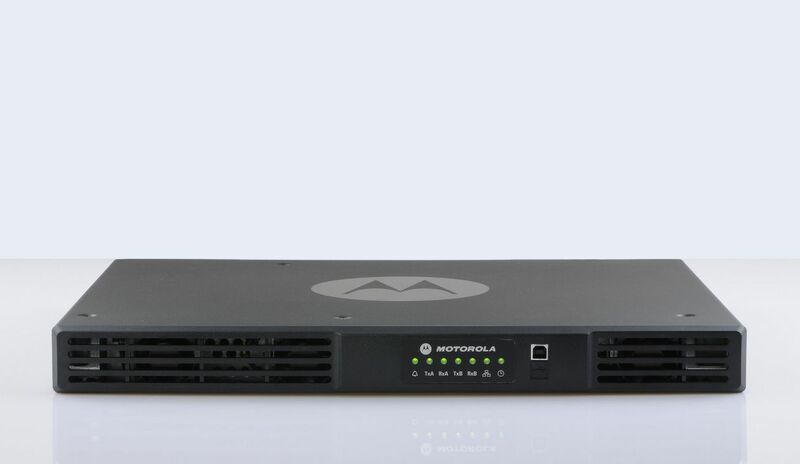 The Motorola SLR 5500, a top-notch, premium repeater, is gradually replacing our outgoing repeater, the Motorola DR3000. The SLR 5500 can be used as a DMR repeater in digital radio systems (with our Motorola DP4800 two-way radios, for example). It can also function as an analogue range booster. Like the DR3000, the SLR 5500 works with digital (DMR) trunked radio, using Motorola's proprietary system environments "Capacity Plus", "Linked Capacity Plus" and "Connect Plus". Our standard Motorola SLR 5500 repeater package comes with "Linked Capacity Plus" installed because we believe this option provides you with the greatest flexibility at an excellent price. With 1 - 50 watts of transmission power, the SLR 5500 easily bests its predecessor, the DR3000. Where two models were needed before (1 - 25 watts and 25 - 50 watts), the SLR 5500 now has it all in one system. This improvement is reflected in the range, too: a transmission radius of 5km or more is now easily possible, depending on the surroundings. In addition to digital radio (DMR), the SLR 5500 also commands analogue radio capabilities (both conventional and MTP-1327). At only 8.6 kg, the Motorola SLR 5500 is lightweight, so even rental shipping rates are considerably more budget-friendly. With over 64 channels to offer, the SLR 5500 has yet another clear advantage over the (16-channel) DR3000. Motorola offers the SLR 5500 in a VHF version with a frequency range of 136 - 174 MHz, and as a UHF repeater with a frequency range of 400 - 470 MHz. When you rent the SLR 5500 from us, we deliver the UHF version, just as we do with all our Motorola radios. But if you'd like the SLR 5500's VHF version, we'll be happy to sell it to you. At only 1 rack-unit and measurements (in mm) of just 44 x 483 x 370, the SLR 5500 is the smallest repeater around. If you're planning to replace your repeater, we'll be happy to provide comprehensive advice, based on over 15 years of experience. Of course, this advice includes very detailed knowledge in the field of antenna technology, positioning and, above all, our expertise in programming the SLR 5500. As is our practice with the DR3000, we're pleased to provide external support and to assist colleagues and users in the programming and creation of Motorola SLR 5500 code plugs. Would you like to rent or buy the Motorola SLR 5500 from us? You've made a great choice. The SLR 5500 will provide you with excellent service on practically any job and will boost the range of your (or our) two-way radios immensely. In short, if you need long-range two-way radios, the Motorola SLR 5500 or, as an alternative, the Motorola DR3000, is the right repeater for you. We'll be glad to draw up a reasonably priced SLR 5500 quote for you. Our unbeatable value includes our Enterprise Service package. Call us at +493029381970 send us an e-mail at mail@Radio-Rental.com or come by for a coffee.